I see a lot of patients with headaches, and when I delve deeper it often is due to muscle strains in the back of the head (the occiput). Some people also have eye fatigue, or numbness and tingling in the fingers. 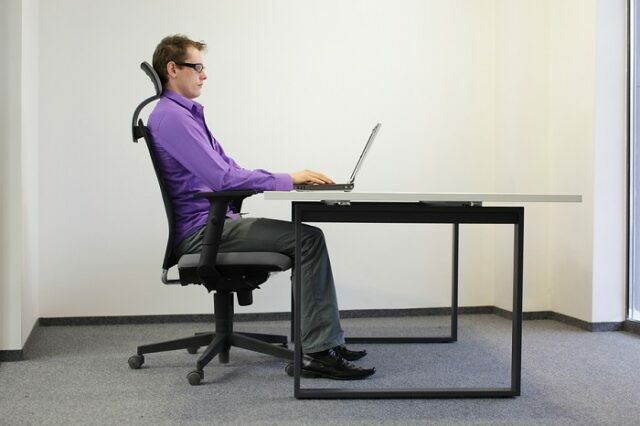 I think this issue is underappreciated, and most companies tend to ignore ergonomics and buy the cheapest chairs and desks. The chair is crucial, and if you feel that your chair or workstation isn’t appropriate, you have every right to talk to your managers and HR teams to get some assistance. Sometimes, a few visits with physiotherapy can help a lot, as they can also teach you some basic exercises both during and after work. Here at IMC we have a good physiotherapist, Dr David Zhang, who also can perform acupuncture for the more adventurous types. And don’t forget that pillows are important; too soft a pillow (or too hard) can cause a lot of neck and upper back problems. I really like the foam contoured pillows at Muji; my current favorite is a really cheap pillow filled with dried buckwheat seeds that I picked up at a local market. Previous PostCan The World Cup Affect Your Health?Next PostWhich Asian Fruits & Veggies Are Healthiest? Good advice, but be careful with arm rests. If you ever experience numbness/tingling in the outer two digits of your hand, be aware that you may suffer from the lesser-known cousin of carpal tunnel syndrome: cubital tunnel syndrome. The numbness is one of the first signs of the onset of this problem, which is caused by the compression of the nerve that runs through your elbow. Using chair armrests can actually make it worse — when I was diagnosed several years ago one of the first things my neurologist told me to do was to take the armrests off my office chair. That helped, as did being attentive to not leaning on my elbows when sitting at tables, etc. B-complex vitamins can help with nerve regeneration. My symptoms almost always flare up after long airplane flights where it is almost impossible to keep pressure off your elbows — the first real serious episode I had was after a series of long trans-oceanic flights over the course of about six weeks. I got some gel pads for my elbows that help a little bit, but I almost always have some numbness for a few weeks after a long flight.